Trevor - Trevor is the owner of Ridesure. He has been riding since having a BSA Bantam scrambler at the age of 11, through the age of the Fizzie (1975) on his Garelli Tiger, various 125’s , 250’s through the 70’s and 80’s and so on until the present. In that time (49 years phew) he has done motocross and enduro’s ( too old now though). He has been a Senior Observer in the Institute of Advanced Motorcyclists, RoSPA Gold Advanced Rider as well as DSA Approved and full time Instructor since 2002 after being an aircraft engineer for 28 years. Audra - Audra is a partner in Ridesure, she actually learnt to ride and took her test with us in 2003. 3 years later after riding a GSXR400, a Bandit 400 and three 600 Fazers she qualified to instruct. She also runs the office and the novice intro’s are her baby. Roy - Roy is one of the stalwarts of Ridesure , having been with us since the beginning. He has ridden for the whole of his ( considerably long ) life starting off at 16 in 1974 on his mum’s moped. Progressing at 17 to a Matchless 650 with sidecar. As a hairy beast he rode and owned all sorts, and now as a hairless one he rides a BMW 1150 GS adventure. The Ewan and Charley type. Roy is unflappable and great fun as well as very thorough and meticulous. Audra says he has the patience of a saint. Bryan - Bryan took his full moped test at 16 and then rode for 4 years on motorbikes thinking he had a full licence. After discovering the error of his ways he took his motorbike test and has been riding ever since ( 22 years ). Bry likes to throw himself in the mud on his TTR600 when he isn’t riding on the road. He is a really good chef as well as a fully qualified bike instructor so he is always in charge of the Christmas do and Barbecues. Mark - Mark has been riding for 40 years as of 2018 on and off road. 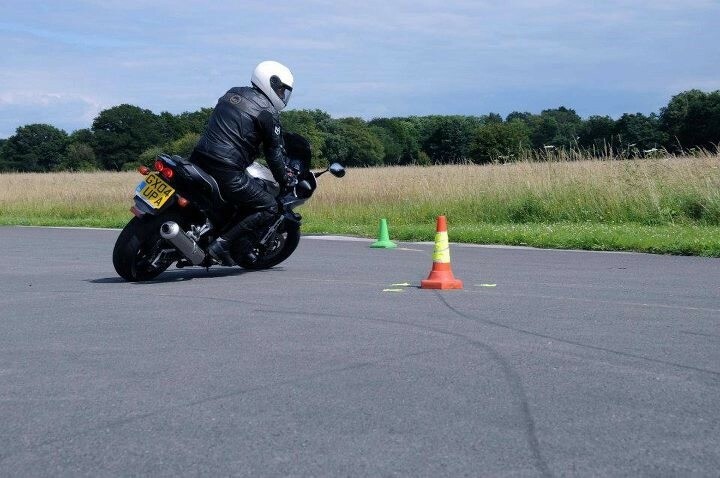 He passed his motorcycle test in 1978, and holds a Direct Access and CBT instructor certificate from the Driving Standards Agency at Cardington. An active member of the IAM, Mark has ridden all over both the UK and Europe. He has owned a wide variety of motorcycles from Harley Davidson to GSXR sports bikes, and pretty much everything in between. He maintains all his own bikes. Both his sons got their licences here, which is how he ended up working for us. Andy - Andy was one of our students. Since passing his bike test he has taken up track days, lots of them. He has a GSXR750 for this pastime and takes it all over Europe. He has now just taken up off roading and has been studying the byways from very close up. Andy has a laid back character and we are glad to have him as CBT instructor with us. Barrie - Barrie has been riding in excess of 30 years, since passing his full motorcycle test in 1986. Initial riding was for commuting to and from work all over the south-east of England. In 2005 Barrie became a member of Thames Vale Advanced Motorcyclists (TVAM). He passed his advanced test in February 2006 and has gone on to become a National Observer. Barrie regularly organises and leads group rides and has toured extensively in the UK and Europe. Barrie continues to ride for pleasure as well as business. His claim to fame is that he designed and managed the building of the IAM HQ building in Chiswick. Another BMW rider. George - "I started riding when I was 15 (back in the dark ages) In the summer holidays I would wait for my Dad to leave for work and pounce on his moped and tear up and down the garden on it. Occasionally hitting garden furniture and the shed and once running into the greenhouse. I eventually mastered the technique of balancing the clutch and throttle but not until after losing a lot of pocket money in the process. As soon as I reached the ripe old age of 16 I bought my very first bike I can’t remember the make but it was very old and had a hand gear change. After very quickly establishing that this was always gonna be a pig to ride I bought an ex GPO telegram delivery bike a 125cc BSA bantam with a sprung seat and a little box fitted to the rear mudguard to hold the telegrams communicating methods in the dark ages was a very slow process as you can imagine. Motorcycles have always been my passion. So when my son arrived on the scene I was in a dilemma, did I now have to sacrifice my passion and opt for a safer mode of transport for my now growing family? I was now a sensible adult and couldn’t enjoy myself anymore, so I sold my Suzuki 500 Cobra and traded it for a Motorcycle and sidecar, namely a 1965 BSA rocket goldstar with a Swallow sidecar. Since then I have owned 3 VFR’s, 3 Fireblades Kawasaki ZZR1100 (awesome) Pan European ST1300, BMW Rt1200, Triumph sprint ST, BMW GS adventure , BMW K1600 GT SE and currently a BMW R1200RT. I’ve ridden thousands of miles around Europe my last big trip was to Hungary Via Slovenia, Slovakia, Austria and Germany but most of the time was spent in France and Belgium a much underrated country. I am an advanced riding instructor For Rospa. I have been a Gold Grade for about 10 years and I also hold the the Rospa Diploma in Motorcycle Instruction. A member of IAM but I don’t participate in any of the local groups activities. For the last 20 years I have worked for DSA as a driving examiner most of which was spent testing new motorcyclists finally retiring this year. I have been fortunate in having a job that paid me for doing something I loved not everyone can say that. Now I am able to spend time with new riders hopefully passing on some of the stuff I have learned over the last 50 years and also having fun coz’ that’s what riding a bike is all about". Alex - Alex has been with Ridesure since 2008. He is a qualified Advanced Police motorcyclist a member of the IAM and both CBT and Direct Access qualifield. He regularly tours Europe and is looking forward to many more years of riding the Alps and further afield. Tim - Tim learned to ride and drive at an 'early age' but took up 4 wheels and then worked in the emergency services for many years, finally taking the 2 wheel test in the 1990's. Since being on two wheels Tim has been lucky enough to become a CBT Instructor, an IAM Advanced Rider and Observer, a BikeSafe Assessor, the Lead Firebike Team Rider, a Moto Safety Rider and a Biker Down Instructor. On top of that Tim organises European Trips and Tours for friends and colleagues and has found some cracking biking roads with less traffic on them! Mounir (Alf) - Alf was one of Ridesure’s students where he trained at the school, back in 2006, for both his CBT and Direct Access. 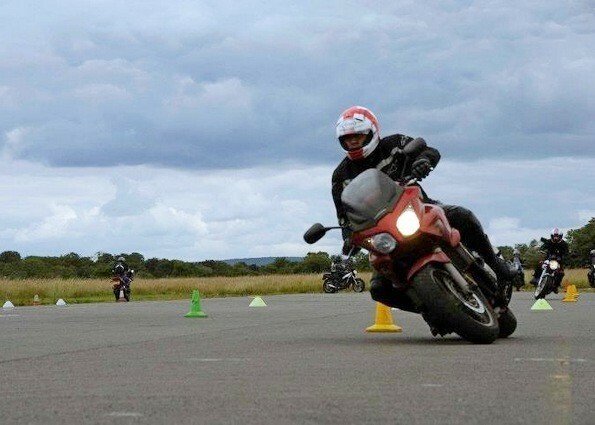 He was qualified as CBT instructor in July 2018 following several months of down-training at Ridesure. Alf currently rides a Suzuki GSX1300R (Hayabusa) and a Kawasaki ZZR1400. He enjoys instructing, joining rideouts, participating in track days, delivering blood as a volunteer member of a regional Bloodrunners group and occasionally commuting by bike to/from work. Colin - Although Colin's first bike was a BSA Bantam owned in the last millennium, his leisure interests developed towards shooting, fly-fishing and sailing. His training at Ridesure in 2008 brought Colin back to biking and he now has three bikes in the garage including an Indian-built Royal Enfield. Colin undertook his Advanced training with the IAM and he is now a National Observer and enjoys road, track and off-road riding. Colin is possibly the most enthusiastic CBT instructor you will ever meet. Colin's life-affirming motto is : Melita, domi ad sum! Stuart started riding at 15 (not on the road, honest officer!) and after some years on 125s finally pulled his finger out and passed his bike test in 1996. Stuart trained for and passed the IAM advanced bike test in 2001 and in 2007 he decided to complete the set and start training for the RoSPA test as well. To kick this off he decided to use some vouchers from his company to get some one-to-one advanced training with a local instructor ( guess where ). After a useful couple of sessions, Trevor asked Stuart if he had ever thought of teaching and Stuart subsequently joined the CBT team at Ridesure, becoming the company's resident expert on gloves ( in joke ). Stuart passed the RoSPA Advanced test in 2008 with a Gold pass and achieved Gold again at his first 3 yearly re-test in 2011. In 2008 Stuart became an approved tutor with RoSPA Thames Valley Group and has represented their bike section at committee for the last 2 years. Stuart currently rides a 2007 BMW R1200GS and also owns a 1977 Triumph Trident T120.